3) Adriaan Louw and the ISPI just published a great study on pain education and how it can save the healthcare system a ton of money. Here is a quick flow sheet to understand the process. He also has a nice post on the important question, is it a tissue problem or a pain problem? Adriaan’s Medbridge course is worth the subscription alone. 5) According to research, PRP doesn’t work in shoulders or achilles. 6) What are you really doing with manual therapy? And how do you explain it to your patients? Should you remove certain things to streamline your practice? 9) Open up your hips the GMB way – some great hip mobility drills. 10) I’m a fan of getting my shoulder patients into half/tall kneeling and doing exercises like this. 11) Experienced clinicians already know this, but a new study found that people who blame others, catastrophize, and think life is unfair have more pain after knee replacement surgery. 12) I had a patient that fell off her bike and hit her head. Thankfully she was wearing a helmet and she’s okay. 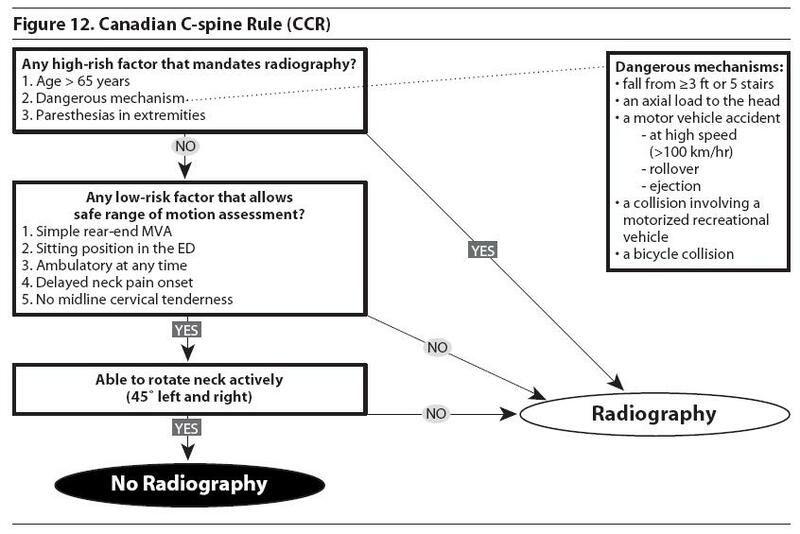 But it’s important to remember the Canadian C-Spine Rules for X-Ray. 13) Strength wins again! New study shows high-load strengthening is more effective than stretching for plantar fasciitis. 14) I love the way Erson teaches MDT. Here’s a clinical pearl on Flexion Rapid Responders. 15) Eric Cressey always has great tips that you can apply to your patients the next day. This is a great one on getting more Serratus Anterior activation during the wall slides. 16) I’ve never even heard of Dynatomes…this current study demonstrates a distinct difference between dynatomal and dermatomal maps. Dermatomes are the distribution of the sensory skin loss from a spinal nerve root. The Dynatomes are the distribution of symptoms from a spinal nerve root. But keep in mind that there are many structures that can refer peripherally, not just the disc and nerve roots. 19) I attended Mark Cheng’s Prehab-Rehab 101 Workshop in NYC. Learned tons of stuff, you can too by reading this. 26) The PRI and DNS people gotta love this study on sagittal spinal position. Running with increased spinal extension causes an increase in patellofemoral joint stress. Running with spinal flexion decreases the amount of patellofemoral joint stress. Proximal Influences. Get a Zone, Keep a Cylinder. 27) The timeline of human evolution summed up in a Andreas Vesalius infographic. 29) Breathing is extremely important. Here’s a study showing it’s effect on muscle activity and cervical ROM. 30) I was discussing chronic pain with a psychologist at NYU and he introduced me to this approach. 33) The Gait Guys put out some of the highest level of information in the social media world. It’s truly amazing stuff that has great implications on how we practice. An example is their unbelievably detailed analysis of tibia torsions. Check out the goods – part 1, part 2, part 3a, part 3b, part4, here, here, and here. Thank you Gait Guys! 35) I’m one of the contributors of the Manual Therapy Daily Flipboard Magazine. This magazine has hourly updates on new articles relating to physical therapy, strength and conditioning, pain, fitness, movement, and health. 36) People You Should Know – Elizabeth “Sister” Kenny (1880-1952) was an Australian nurse who helped lay the foundation for musculoskeletal rehab and physical therapy. Sister Kenny’s controversial approach of treating poliomyelitis patients with movement rather than immobilization changed the course of the disease and improved the lives of the millions affected. She courageously went against the normal medical model and created an innovative approach that has changed the way we treat the human body. Nick Winkelman‏ @NickWinkelman – Coach Tip: The motor system self-organizes to achieve a movement outcome. Cueing the body (ex. Squeeze Glute) interrupts this process. John Hawks‏ @johnhawks – The lone scientist is a myth. Great problems today are tackled by teams of scientists with different expertise, working together. Ram Dass‏ @BabaRamDass – Information is just bits of data. Knowledge is putting them together. Wisdom is transcending them.